This entry was posted in Recovery & Support and tagged Coaching, Help, Recovery on June 15, 2016 by Baxter Ekern. Contributed by RiverWoods Behavioral Health System clinical content team member Kathryn Taylor, MA, LPC/MHSP. The decision to clean up your finances after substance abuse episodes is a positive step. Financial debt and financial problems may seem like a dark cloud that you would like to avoid, but progressively diminishing the shadow that it casts on your financial opportunities will give you a sense of accomplishment and add a measure of relief to your healthier, new lifestyle. If addiction led to financial strain or brought about a poor credit score, improving that score might be an essential element of your financial recovery. If you are simply afraid to check your credit score, rest assured that doing so can be a great starting point. Do not apply for unnecessary credit cards. Pay off your debt rather than moving it to another carrier. Following these steps will, over time, grant you greater ability to qualify for bank loans, purchase a new home or vehicle, or even meet the requirements for applying for certain jobs. Every year, you can get a free copy of your credit report. This report will help you determine if your rating is becoming worse or better. Which Debts To Pay First To Rebuild Credit After Substance Abuse? Find the credit card balance. Divide the balance owed by the credit limit (the amount you are allowed to charge). The answer that you will get by following the above steps will reveal the answer to your utilization ratio. High utilization rates usually mean a worse credit score. If some lines of credit have very high interest rates, you should focus on paying them off first. However, if the interest rates are about the same, and you find that some lines of credit have a high utilization ratio, you might want to take a smart step and work toward paying them off first. Doing the above calculations on your credit lines might lead to surprising results. If you are paying your bills on time, you might assume that your credit score is good. However, if you find that there are high utilization ratios, your score may be lower than you expected. What Kind Of New Credit Card Should You Try To Open? If you would like to open a new credit line to help re-establish your credit, search your bank and other banks for the option of secured credit cards. As long as the card issuer is connected to the major credit bureaus, your stable payments on this card will improve your credit score. However, be aware that this type of card will require a cash collateral deposit when you first obtain it. Do not miss payments! Set notifications to remind you to pay the bills, or set up auto-pay options if you can. If you do miss a payment, do not lose hope or give in to undue anxiety and stress. You can continue to climb out of your bad financial history. Contact the card company and ask to push back the due date. Do not resort to borrowing money to pay off debt, as this can quickly compound your debt problems. Rebuilding credit is not a quick process. Credit reports can go back for seven years. Improvements will show over time, though. When the understanding is there that you have recovered from substance abuse disorder, some leeway may be possible for certain applications. Keep monitoring your scores. If you must file for bankruptcy to get out of debt and this negatively impacts your score, do not be disheartened. Getting clean from drugs is a difficult effort, but we all know that recovery is possible. That includes recovery from the financial symptoms of addiction. What steps have you taken to rebuild your credit? What has worked well for you and which struggles have you faced? Please drop your comment at the bottom of this post. 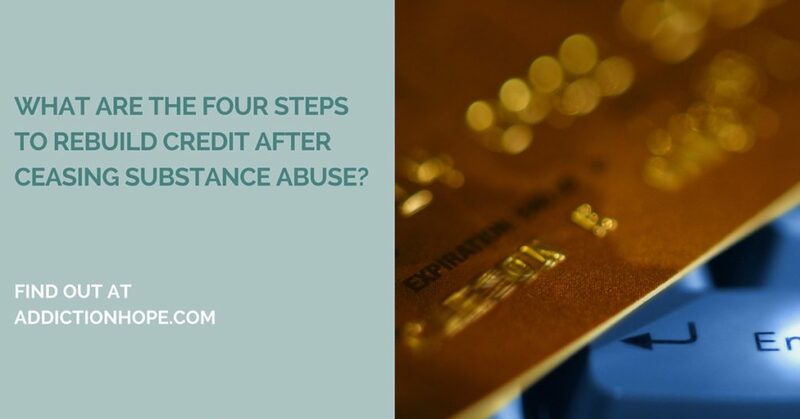 About the author: “How To Rebuild Credit After Substance Abuse Has Left You Financially Ruined” was written by RiverWoods Behavioral Health System clinical content team member Kathryn Taylor, MA, LPC/MHSP. Kathryn has several years of experience working in dual diagnosis addiction treatment, women’s issues and trauma treatment as a licensed mental health counselor. Site Description: Skyway House is a trusted name in recovery that offers comprehensive care for adults and teens who wish to recover from addiction. Located in beautiful northern California, Skyway House offers two residential treatment options for men and women, as well as intensive outpatient programming for adults, a teen recovery program, court-ordered programs and traditional outpatient programs. Serenity House also provides supportive sober-living environments. : Credit Reports and Scores. (n.d.). https://www.usa.gov/credit-reports.